The Hastings Centre Rockhounds Club is inviting you to participate in our Annual Rock, Gem & Jewelry Show. 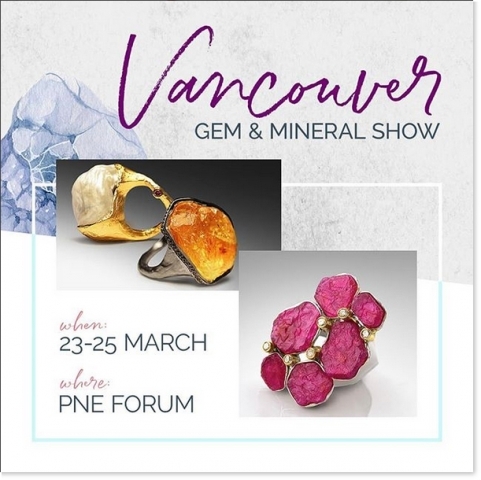 The show is scheduled for Saturday and Sunday, March 16th & 17th, 2019, and will be held at the Hastings Community Centre, 3096 East Hastings Street, Vancouver, BC. We usually have approximately 600 visitors per day. All participants and dealers are requested to be ready for the 10:00am opening on Saturday by arriving and setting up their tables on Friday March 15th, beginning at 7pm. Full payment is required by February 1, 2019 in order to secure your rental space. 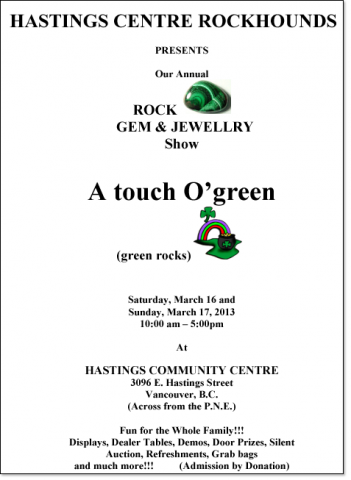 Please make cheques payable to Hastings Centre Rockhounds. Security will be provided during the nights. There is parking surrounding the community centre, and we would like to remind you to leave the closer spaces (ie; parking lot and street parking in front of centre) for the visitors to the show – these are your potential buyers! 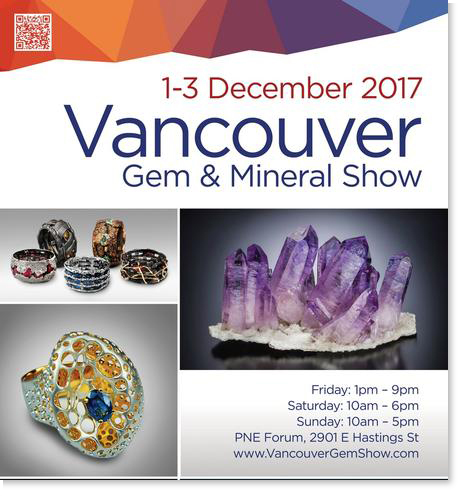 There is a lower parking lot for dealers and participants (that is monitored) on Pender Street (you can unload first, then please move your car for the duration of the show). If you have any further queries, please feel free to contact me by the email address above. We look forward to your participation in our show, and hope to hear from you soon. Demonstrations Displays Dealers. Admission by donation. Dealers rocks, crystals, gemstones, minerals, jewelry and lapidary supplies. 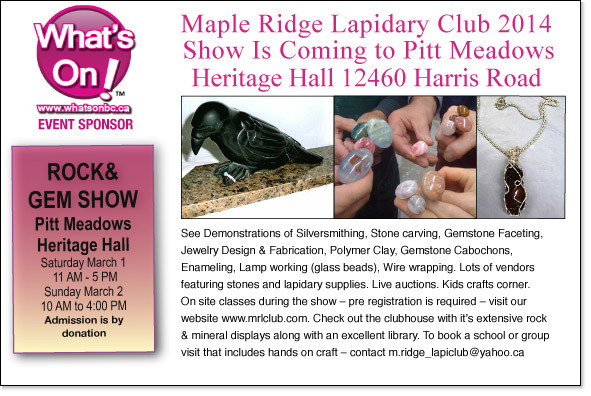 Demonstrators – lapidary, silversmithing, carving and more. 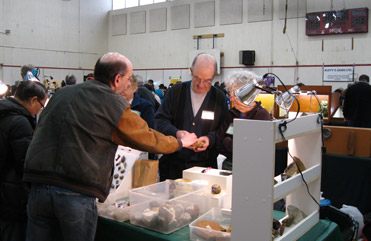 Club members displaying their crafts and collections, silent auction, door prizes and lunch counter. For those of you who have yet to experience it, Summer Camp is an opportunity for BCLS members from all over the province to gather, socialize and rockhound in a different area of the province. Generally, it is four days of organized field trips and five nights of social activities. 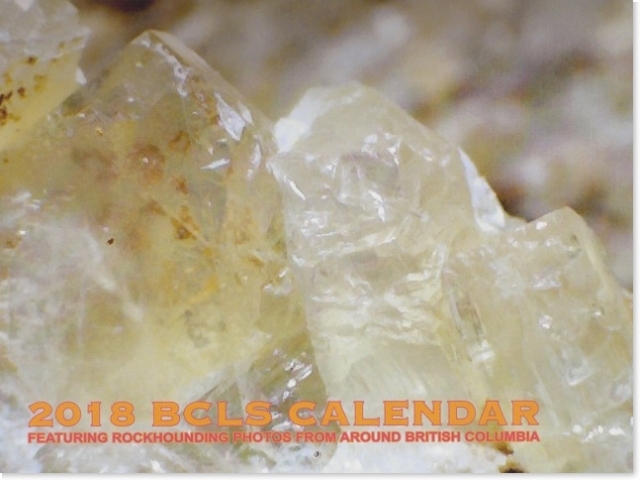 The Lakes District Rock and Gem Club has again graciously agreed to co-host the event with the BCLS at Takysie Lake, about an hour south of Burns Lake, after last year’s event was cancelled due to forest fires. 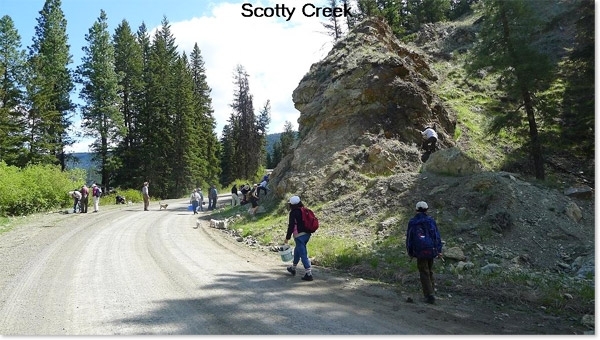 A few members braved the smoke and closed highways last August to check out the area, and were very happy with the resort and the lapidary materials available in the area. More information about this year’s Summer Camp and facilities information can be found by viewing the two links below. Please pre-register with Phillip Crewe by phone or by email beforehand sowe have an idea of numbers. Phillip can be reached at 604-526-3045, or by email. General Event Information is available here. Facilities Information is available here. If you have any additional questions, please feel free to contact me, D. Cullen – BCLS Calendar Coordinator. Manda accepting the BCLS Scholarship for Crystal, with club President Brian. 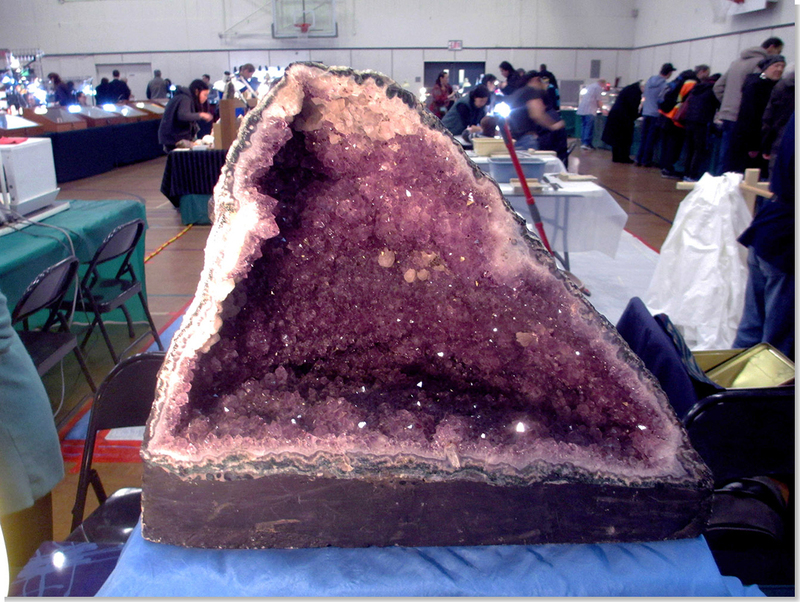 The winner of the BC Gem Show Raffle Prize was ticket #0235, Nickell A. Congratulations Nickell. 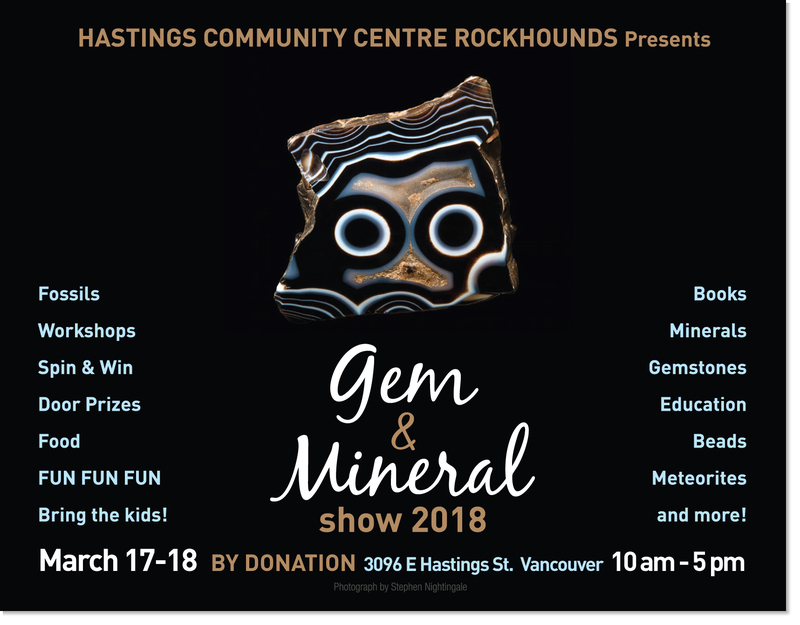 You are invited to attend the Hastings Centre Rockhounds Annual Rock, Gem, and Jewellery Show on Saturday March 11 and Sunday March 12. 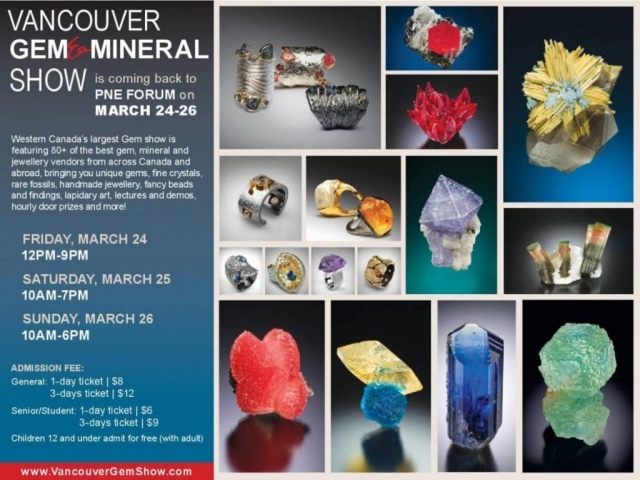 The show is held in the gym at the Hastings Community Centre, 3096 East Hastings Street, Vancouver. Admission is by donation. Hours are 10 am to 5 pm each day. We are very proud to show the public our unique and beautiful treasures our members have crafted with their own hands. Each piece represents skill and patience along with a bit of creativity. We will also have various demonstrations in cabochon making and Jewellery making. Stop by and see how the craft is done! 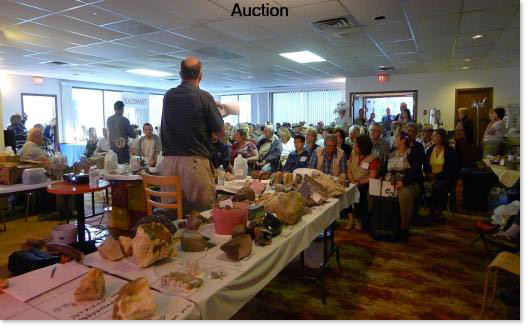 Along with our members’ tables, we have invited others in the rock and lapidary community to sell their products that are of interest to our hobby. You will find rough rock, mineral specimens, slabs, tools, finished products like tumbled stones and jewellery, as well as books and findings. The Silent Auction, Grab Bags, and Spin and Win ensure that everyone can go home with something special. We offer fun for the entire family. Our concession table has lots fresh and tasty goodies available to indulge the senses and satisfy your taste buds. Playing with rocks always work up an appetite. 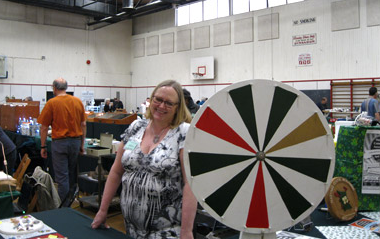 Our annual show is also membership drive which connects us with people who may become active new members in our club. We welcome your interest and questions. Please make plans to attend our show and bring all your friends and family since everyone is welcome. We look forward to spending time with you. 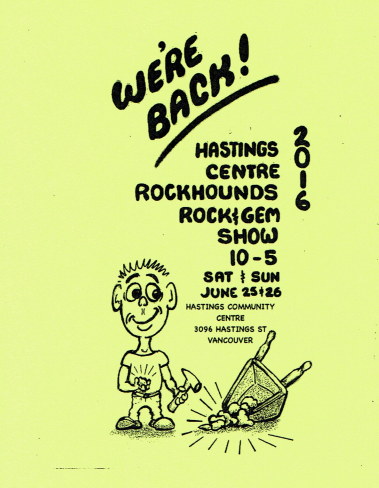 You are invited to attend the Hastings Centre Rockhounds Annual Rock, Gem, and Jewellery Show on Saturday June 25 and Sunday June 26. The Silent Auction, Grab Bags, and Spin and Win ensure that everyone can go home with something special. We offer fun for the entire family and children can partake in a unique experience and take home their own hand made crafts. 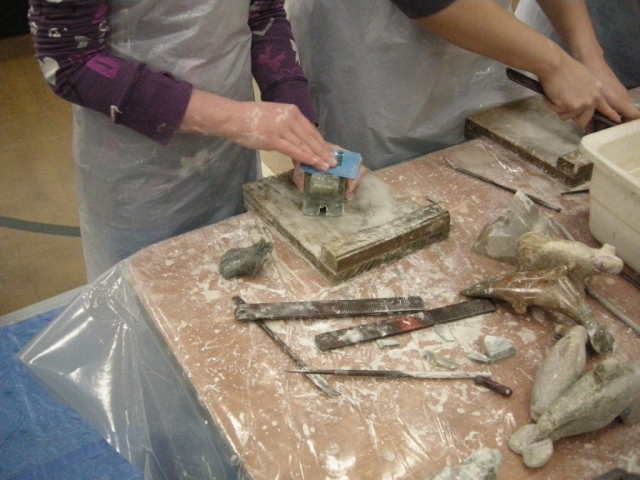 This year we will be continuing the highly popular soapstone carving and tumbled stone picture frame making. See our brochure for details on these activities. See and shop special fossils, rocks, minerals, gems, jewelry, 30 some exhibits, an ongoing silent auction, raffle, gold panning, and lapidary and fluorescent black light demonstrations. Also special activities for the kids, and still more. Proceeds help fund the clubs WWU scholarship program. Join us! (Thanks to the Bellingham Parks & Recreation Dept. for their support). Information – 961-7873 or Mt. Baker Rock Club. Hastings Community Association’s AGM will be held in the Auditorium, upstairs at Hastings Community Centre, 3096 East Hastings Street. Childcare will be provided. 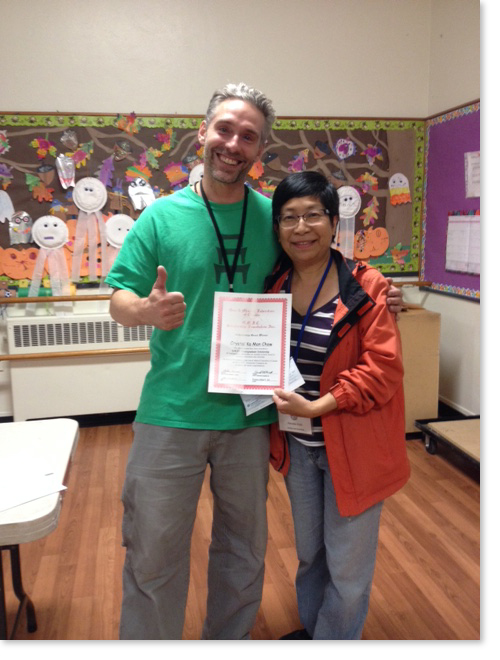 Please phone Alice at 604.718.6233 to register your children for care, before noon Wednesday. 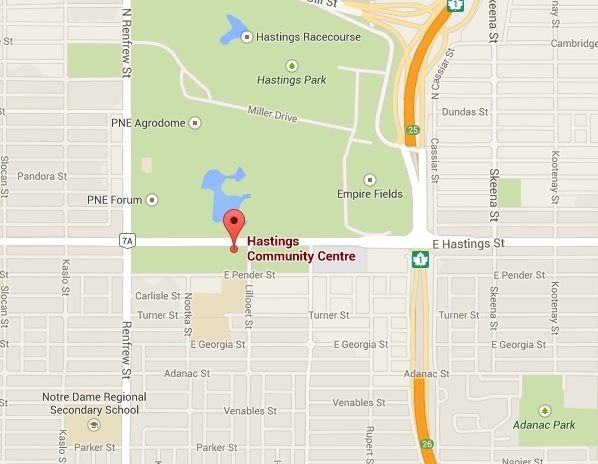 The Hastings Community Centre is jointly run by the Hastings Community Association and the Vancouver Park Board. The HCA is run by an elected volunteer board. They are your friends and neighbours in the community of Hastings Sunrise. 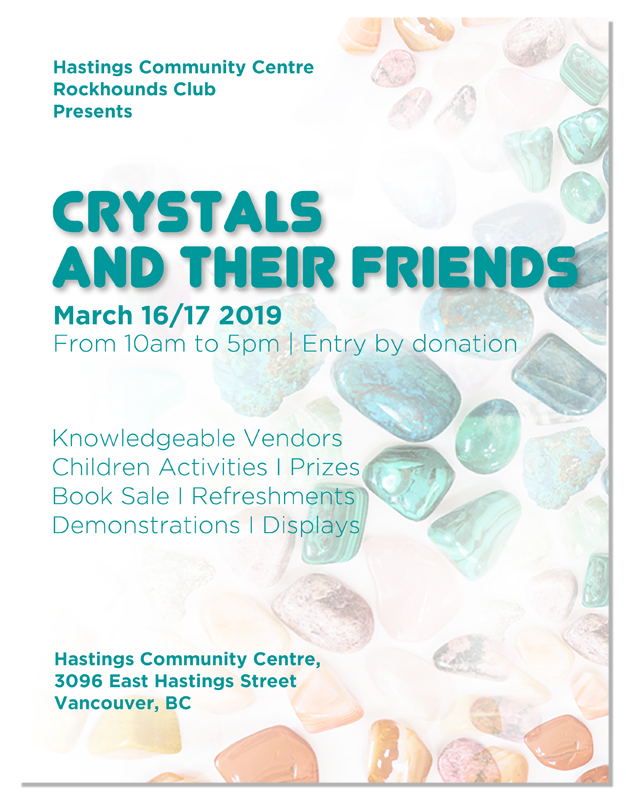 Hasting Community Association memberships are required for everyone taking part in a program or activity at the Hastings Community Centre. Buy yours at the front desk or call 604.718.6222, Ext. 2. Hastings Community Association members are invited and highly encouraged to attend the AGM. The HastingsCommunity Association (HCA) works in partnership with the Vancouver Park Board to provide recreation, social, educational and cultural opportunities in the Hastings-Sunrise area. The HCA provides subsidies for low income users and emergency financial support to community programs. Through its activities and committees, the Association ensures that the community is represented at the Centre, Templeton Park Pool and in local planning & development issues such as the redevelopment of Hastings Park. The HCA has about 100 volunteers, and members of the public are encouraged to become involved. You are invited to attend the Hastings Centre Rockhounds Annual Rock, Gem and Jewellry Show on Saturday March 14th and Sunday March 15th, 2014. 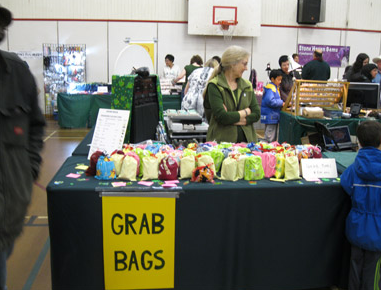 The show is held in the gym at the Hastings Community Centre, 3096 East Hastings Street, Vancouver. Hours are 10 am to 5 pm each day. We are very proud to show the public our unique and beautiful treasures our members have crafted with their own hands. Each piece represents skill and patience along with a bit of creativity. 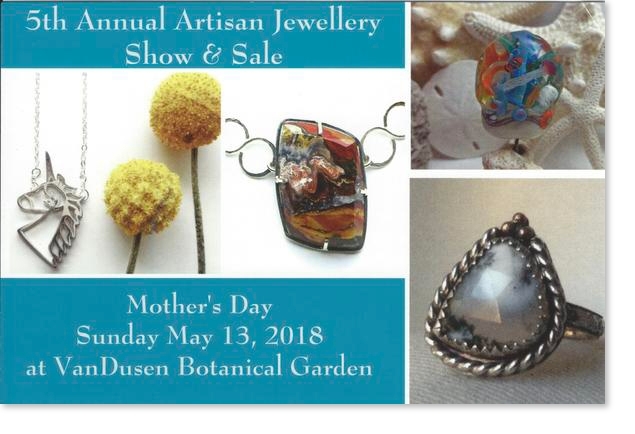 Our show will have demonstrations in cabochon making, wire wrapping, bead weaving and silversmithing, along with other lapidary arts depending on who drops by. There will be our ever popular touch table; a collection of large specimens on loan from our members showcasing rocks from all over the world. This is a great opportunity to see and touch large raw stones in their natural form, this can be sometimes quite different than the finished product. The Silent Auction, Grab Bags and Spin and Win ensure that everyone can go home with something special. 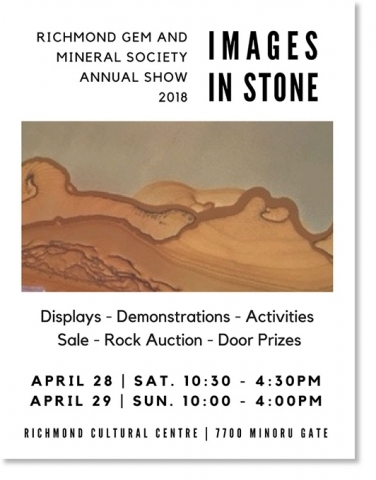 Besides members’ displays, attractions and events, we have invited others in the rock related community to sell their products that are of interest to our hobby. You will find rough rock, mineral specimens, slabs, tools, finished products like tumbled stones and jewellry, as well as books and findings. We have over twenty five different sellers with tables of items for sale. To make a reservation at Cyoosh Creek Campground contact Wayne Robinson, Lillooet Recreation Office at 250-256-7422 extension 249. Please note that Cyoosh Creek Campground is under construction. Summer Camp participants is the only group that is allowed to camp here. For this reason there will only be power, water hookup and sani dump. To download a list of accommodations in Lillooet click here. For more information about each accommodation visit Lillooet Accommodations. To download a list of restaurants in Lillooet click here. For more information about each restaurant visit Lillooet Restaurants. To view the Lillooet Camping Guide click here. More information will be posted as it becomes available or contact Verne Brooks at 604-329-9213. 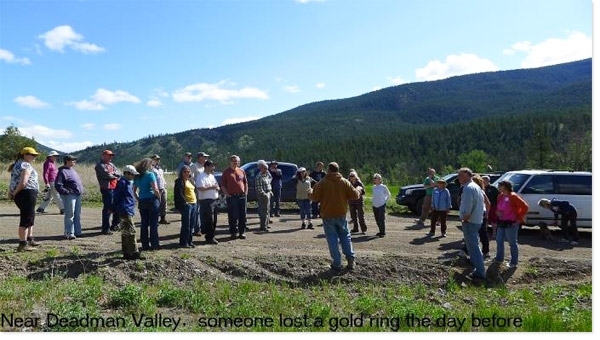 Ashcroft, BC has been choosen by the BCLS for its central location to an abundance of collecting sites. Native semi-precious minerals in the area are jasper, common opal, amethyst, jelly opal, agate nodules, banded agate, smokey agate, quartz crystal, calcite, orange calcite, fossils, gold, and copper. The Thompson Valley Rock Club will be holding the main events in the Ashcroft River Inn. The Inn is in close proximity to the Village RV Park and main street plus it has ample parking. Accomodation rates are currently being negotiated. The Village RV Park park offers water, power and a sani- dump. Special arrangements have been made for tenters at the Village RV Park on the grass. There are two washrooms with one shower in each. There is also free-dry camping available. 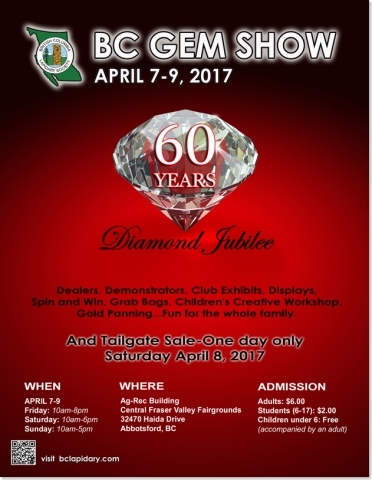 Additional information will be posted as it comes available or you may contact David Hunter at 250.453.9556 or email David. 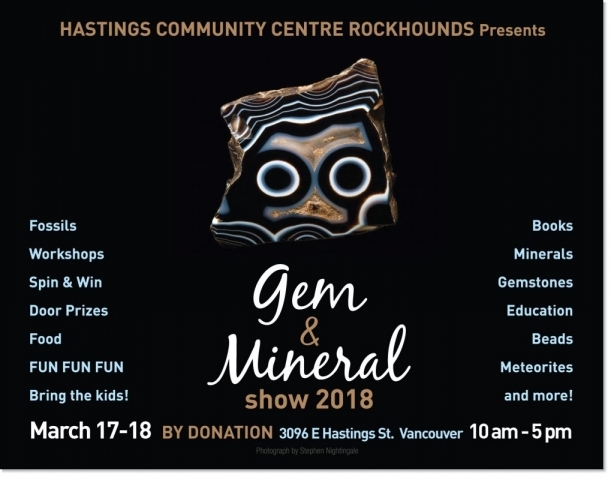 The Hastings Centre Rockhounds would like to invite everyone to attend our annual Rock and Gem show, to be held March 16th and 17th, 2013 in the gym at the Hastings Community Centre, 3096 E. Hastings Street, Vancouver. The hours are 10 am to 5 pm both Saturday and Sunday. This show is our opportunity to showcase our hobby of the lapidary arts which includes the collecting and working of both local and worldwide rocks and gems. Some people go “rockhounding” locally in places as close as the Whistler/Pemberton area or as far away as Australia or Europe. 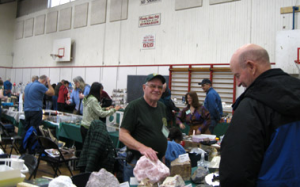 For some, the easiest type of rockhounding is purchasing various stones from local sellers at either shops or at the various rock and gem shows held by local clubs such as ours. Once a stone is acquired there is always the question of what to do with it; does one just keep it as a ‘specimen’, or work it into a beautiful piece of jewelry to wear? 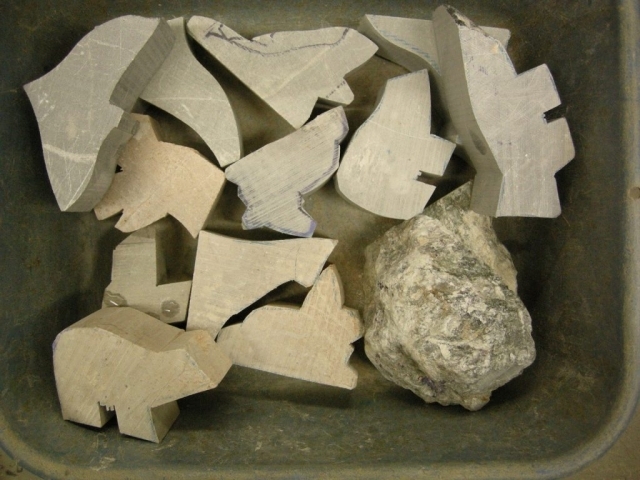 We will have demonstrations of the different ways to change an ‘ordinary’ rock into something of a thing of beauty. There will be soapstone carving, cabachon making, wirewrapping and silversmithing just to name a few. A popular aspect of the show is what we call the touch table; this is a table with natural ‘found’ rocks on it (BIG) so people can get a feel for the stones in their natural form. We also have lots of fun at these shows with the silent auction, the spin and win wheel and the grab bags that are still only $2.00 each. Along with the tables that showcase our hobby, we will also have sellers with a wide display of items to purchase. 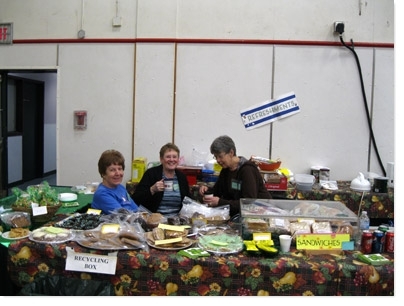 Our refreshment table is always popular as well, with many home baked goods and snacks to fill your belly while you absorb the atmosphere of our well attended show. So, welcome, please come to our show and check us out, the admission is by donation and the membership table will be available if you would like to join our group.